Medical examinations and vaccinations are required for anyone who applies for lawful permanent resident status in the United States (Form I-485). Accord Medical Group is authorized by the U.S. Citizenship and Immigration Services (USCIS) to provide medical examinations for immigrants applying for their green card. Payment (check with the doctor’s office about acceptable forms of payment). During the exam, you will be tested for communicable diseases such as tuberculosis (TB). We will also check your medical records to see if you need any vaccinations, which we can provide. In addition, we can take a blood sample for a Titer Lab Report. A titer is a laboratory test that measures the presence and number of antibodies in your blood. It is used to prove your immunity to disease in the event you don't have the medical records to prove it. After the exam, we will complete Form I-693, provide you with a copy for your personal records, and seal the completed form in an envelope for you to submit to the USCIS. Note: The USCIS will not accept the form if the envelope has been opened or altered. 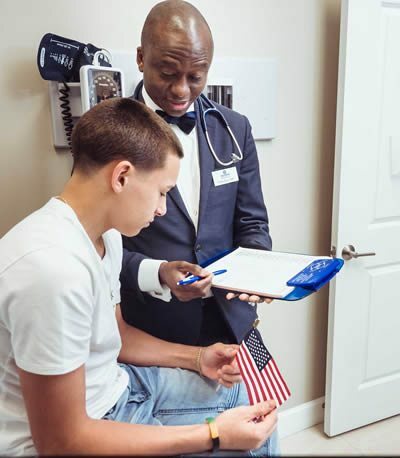 To schedule an appointment for an immigration physical, call Accord Medical Group at our office at (813) 374-2406 or request an appointment online.